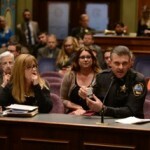 Executive Director, Chelsea Laliberte Barnes, MSSA, Lake Villa Police Chief, Craig Somerville, and IL State Senator Melinda Bush provided testimony on Lali’s Law to the Senate Mental Health Committee in Springfield, IL. Lali’s Law eventually became a part of Heroin Crisis Act, which initiated pharmacist-prescribed naloxone. Pharmacists can now train and distribute naloxone at pharmacies across Illinois. 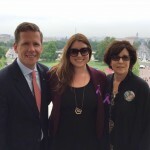 Congressman Bob Dold, and cofounders, Jody Daitchman and Chelsea Laliberte Barnes, MSSA, in Washington DC the day of the House vote for Lali’s Law (it passed 414 to 5). It is hopeful to become a part of the Comprehensive Addiction & Recovery Act (CARA). Chelsea Laliberte Barnes, MSSA, Kathie Kane-Willis, Laura Fry, Alisha Gilani, Tess Benham, Felicia Miceli and Benjamin Waite prepare to lobby in Springfield to override Governor Rauner’s veto of Heroin Crisis Act. We won!